Setting the mood for romance, Albert Ickenroth creates a beautiful design. 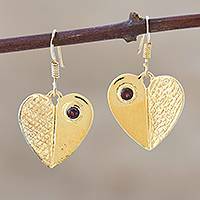 A shining heart hangs from a smaller heart in these sterling silver earrings. He accents the borders in 22k gold. Crafted by hand, golden hearts dance excitedly on silver half-hoops. Carlos Muñoz creates mesmerizing earrings with a theme of love. He works in silver bathed in 22k gold. Golden hearts promise love in earrings designed by Khun Boom. 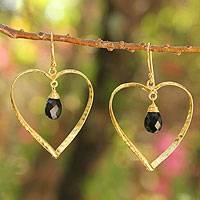 The handcrafted 24k gold plated earrings glisten with the romantic beauty of faceted spinel totaling two carats. 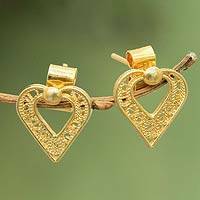 Golden hearts promise love in earrings designed by Khun Boom. The handcrafted gold vermeil earrings glisten with the mystical beauty of faceted amethyst.